Business process outsourcing has been something of an industrial matchmaker for the global business world, connecting savings-seeking clients with skills-rich solution providers. Capgemini's Hubert Giraud tells Ellie Broughton how a third wave of global locations and services is taking the industry to the next level. The practice of business process outsourcing (BPO) is about to come into its third decade. Its remote backoffice capability now reaches into emerging markets full of skilled graduate and entrepreneurial workforces. Once unthinkable in finance and customer service, it is now hard to imagine a multinational corporate that handles all of its operations from a domestic headquarters. CFOs in particular have become much more concerned about the economic need for cost-effective business processes, not only for cost savings but also best-in class processes. Capgemini has served the IT community since 1967 and its outsourcing division came to the fore at the end of the 1990s. It employs over 105,000 people in 35 countries, including 5,975 workers in India, and posted global revenues of €8.4bn in 2009. Hubert Giraud, CEO of global BPO at Capgemini, would be the first to point out that outsourcing requires more client engagement than most people realise: it's not the case that clients can simply pass their work to someone else and forget about it. Capgemini markets its work as a ‘collaborative business experience' and Giraud insists that his company works alongside the client rather than supporting or managing them. The benefits of BPO rely on troubleshooting a number of challenges. First of all, an outsourcing company is not an instant cure for a business' efficiency problems; it is a cooperative solution. "The company must have a credible process to deploy," Giraud says, "and a clear process map and operating model laid out." "Capgemini has served the IT community since 1967 and its outsourcing division came to the fore at the end of the 1990s." Such a map will cover the client's side of the story, seek accountability and highlight who's doing what within the organisation. This avoids a lot of potential difficulty. "Sometimes the challenge is that people have done a lot of technical work and set up ERPs. But behind the scenes the process is fragmented, especially with operations in different countries." He admits that offshore centres can become "victims of clients' disorganisation". The second challenge is staff turnover. "It's important to attract, recruit, train and keep staff," Giraud says, "but it's true that in most of the hot destinations for offshore centres there's a lot of attrition." Some employees may feel the need to abandon their employers in pursuit of rapid salary growth and promotion. According to Giraud, the ability to stabilise, satisfy and retain a workforce is vital to the sustainability of a BPO operation. The control of salary progression is an offshoot of this more general challenge, and a major aspect of the cost base of a company's financial model. Currency is also subject to ongoing instability. "We're not in a period of high stability," Giraud says, "what with everything moving up and down – not by a few points but by 10%, 15% or 20% in a few months – which can radically destabilise the economics of off-shoring." But, he adds, there's not much providers or clients can do about these fluctuations. "You can hedge and protect your capital flow with policies, but who knows where the currency will go?" In the face of these hindrances, offshore centres must strive to keep making innovative improvements to their performance levels. Times are tough but Giraud believes companies can always benefit from having a competitive edge. Capgemini's own golden goose is Rightshore approach: the outsourcing of work to locations that are relevant to each client's needs. This delivery model provides a specific solution for every client, and makes the most of Capgemini's coordinated workforce across its several international BPO centres. The partnership with Coca-Cola Enterprises (CCE) is one of Capgemini's most prominent case studies, and an exemplary model for its right-shoring solution. "You need three things for right-shoring," Giraud explains. "A robust and well-defined transaction process; a strong global network that links front and back office activities; and the technology to link the two." A change in management at CCE encouraged the company to branch out of its offices in Florida, US, and consider third-party delivery of finance and accounting (F&A). The company signed a seven-year contract with Capgemini in 2008 for the development of centres in Poland and Guatemala, and global operations in India. CCE asked Capgemini to implement comprehensive F&A solutions in order to create an efficient process and a cost-effective environment for order-to-cash services, purchase-to-pay accounting, record-to-report activities and a document management solution. The primary focus was order-to-cash, and Capgemini used a best-of-breed credit toolset to increase efficiency for credit and collection areas in CCE. The automated credit module within the solution created a single set of rules and measurements to streamline the credit decision-making process. The transition period took 14 months to complete. CCE is now on track to achieve targeted savings. Joe Heinrich, vicepresident of its global finance initiatives department, said: "Our internal benchmarks have gotten better, and through good people management we have reduced severance costs." Giraud was also impressed by the ways in which CCE and clients such as International Paper embraced BPO. The paper producer now has hundreds of staff working in a back-office capacity in Krakow, Poland, thanks to Capgemini. "Strong management and a robust internal practice, that's their share of the burden," Giraud says. "The beginning of a big offshore strategy is always hectic so it's important to have the right face-off and escalation, and to have the right people to answer or raise questions if need be." Giraud has watched the industry evolve since its inception. Anglo-American businesses led the first wave and were soon followed by organisations from Scandinavia and continental Europe. The sector became increasingly adventurous and the second wave saw UK and European operations travel to India, while the US looked to the Philippines. "I think we're looking at the third wave, now," Giraud says. He cites the growth of near-shore Latin and Central American outsource centres for US-based companies and Chinese centres for Chinese and Asian corporates, especially the larger Hong Kong and Singapore-based companies. Africa promises to become a strong destination for BPO, after North African nations realised the potential to serve as a near-shore BPO provider for Europe. "It's an industry in its infancy," he explains, "but a few governments are trying to embrace the movement." "The future for global BPO is promising, with higher-value activities coming into greater demand." Capgemini is also "very well represented" in Eastern Europe and Latin America, where the company employs more than 1,500 workers and posts a growth rate of 30-50% a year. But, for Giraud, a long-standing player still leads the market. He highlights India's some 20 years' experience in the industry, entrepreneurial spirit and strong work ethic as reasons for its enduring popularity. The country's service centres are also well-dispersed. The industry branched out from urban centres to second-tier cities in order to stabilise running costs. India is also developing ‘cluster' zones for BPO outlets. Giraud refers to Mumbai for its finance specialism and Bangalore for technology; meanwhile, Chennai, in the south of India, Hyderabad and Calcutta are all mentioned as up-and-coming BPO centres. "All these cities are creating economic zones that offer tax havens, and work hard to attract and retain business," he says. The future for global BPO is promising, with higher-value activities coming into greater demand. Large corporates are stepping up audit and compliance in the wake of fraud scandals and the legislation that followed them, but post-crisis they are equally keen on affordable solutions. Capgemini has developed a managed assurance service to meet the demand and has more than 150 quality accountants and auditors on its payroll. "We are really moving up the value chain," Giraud says. "We started with traditional accounts payable and F&A, and now we provide financial reporting, planning, analysis and tax consultancy." Global BPO providers have set their sights on higher-value F&A, he says, but their first hurdle is getting all aspects of the business in harmony. Clients don't want to see the gaps between international operations centres; they want to see the connections. Giraud is upfront about the reasons Capgemini continues to play such a big role in this industry. "When you have a multinational working in 100 countries," he concludes, "you expect your producer to have one service, not five. We're one company working 24/7. Our success is down to consistency." 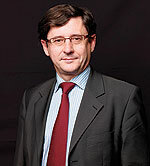 Hubert Giraud, CEO of global BPO at Capgemini.